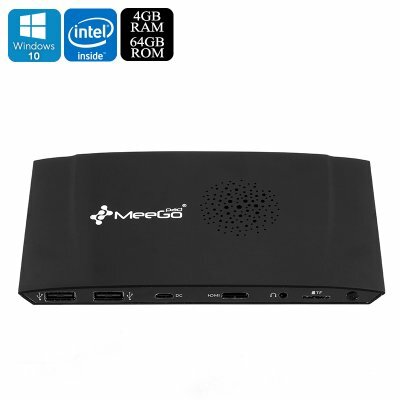 Successfully Added Meegopad T09 Mini PC - Licensed Windows 10, Intel Cherry Trail CPU, 4GB RAM, Dual-Band WiFi, 4K Support, Bluetooth 4.0, 64GB ROM to your Shopping Cart. Enjoy the advantages of your own Windows PC anywhere you go with the Meegopad T09. This mini PC features an extremely compact size and light-weight design. Thanks to this, you can conveniently carry it along on your upcoming business trips or holiday. With its HDMI output, this Windows mini computer can be efficiently hooked up to any large PC monitor out there. Thanks to this, you’ll be able to turn any large display into your own personal computer. With its licensed Windows 10 operating system, this mini PC lets you enjoy all the trusted Windows and MS Office features. It comes packed with an Intel Atom Cherry Trail CPU that has been clocked at 1.44GHz. Additionally, it features 4GB RAM. With this hardware at your side, the Meegopad T09 mini PC is even capable of handling FHD media and general games. Whether you use it for business, entertainment, or simply like to browse the web – this Windows mini PC is sure to meet your demands. This Licensed Windows mini computer supports ultra-HD 4K media. Therefore it can additionally be used as a Windows TV box that turns any regular screen into a full-blown smart TV. With Dual-Band WiFi support, you’ll be able to browse the web at lightning speeds and download or stream media in the blink of an eye. Your mini PC comes with 64GB ROM and a 128GB SD card slot. This provides you with all the necessary memory to store all your favorite files and media. The Meegopad T09 comes with a 12 months warranty, brought to you by the leader in electronic devices as well as wholesale mini computers.. This device comes with a licensed version of Windows 10 Home. As a wholesaler, we provide no software support, advice, or training regarding the operating system and software.